If you haven’t heard from Stormy "T" Trevino in about 13 hours, and you’re more than a little worried, don’t go calling the police. Do what his friends and loved ones do: Check his kitchen first. That’s where you’re sure to find SLO’s resident canner, with his head and heart inside a Mason jar. If he’s not covered in beet juice, you can bet he’s up to his armpits in dilly beans, asparagus, or Brussels sprouts. Or maybe he’s playing mad scientist, imbuing mounds of fresh herbs and spices with bubbling brines. One thing’s for sure: He’ll be deep in the groove of his art. So deep, in fact, that time has lost all meaning—as his other half, Cyndi Hafley, can attest to. But if losing half your day without a worry is the test of true creative joy, then it’s safe to say the local has found his Next Big Thing. Stormy T Trevino has become the man with the can. JARHEAD: Stormy “T” Trevino is obsessed with preserving the flavors of the seasons with his small-batch canning operation, Stormy T’s. 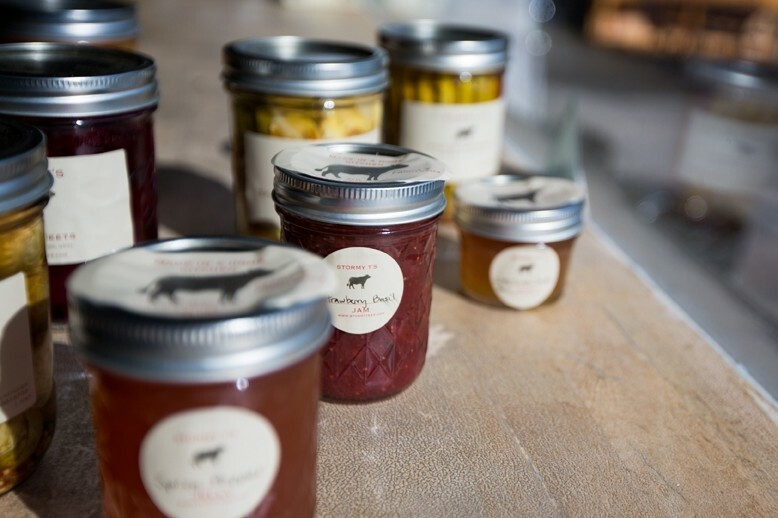 The SLO canner’s pickled veggies, spiced fruit jams, and mind-blowing beer jellies are now taking up real estate at General Store Paso Robles, SLO Natural Foods Cooperative, and Lincoln Market in SLO. 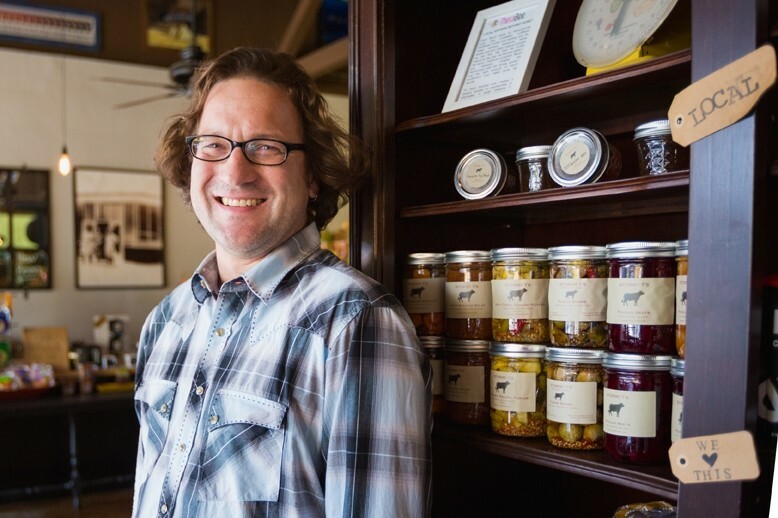 When Trevino created a Facebook page for his fledgling business in September, he never dreamed his pints and quarts of pickled veggies, fruit jams, and spicy, roasted salsas would soon be stocked in stores from SLO to Paso Robles. Massive orders for gift baskets now flood his inbox. Craft cocktail slingers are jumping for the chance to dip his uniquely-pickled asparagus spears into their bloody marys. To understand this madness, we must first give a nod to Trevino’s grandma, who ran the cafeteria at Greenfield Elementary School. Each jar of “Stormy T” goodness promises a handcrafted, small-batch product filled with only the freshest, finest local herbs, spices, and produce. Safe to say, his grandmother, now in her 90s, is very, very proud. Fruits and veggies are sourced from Green Family Farms, Battista Farms, and farmers’ markets, and you can bet whatever looks good goes in the mix. When a particular crop hits its glorious seasonal peak—say, Brussels sprouts—Trevino rushes to preserve the flavors in a flash. It’s true: Each jar varies from season to season, echoing the Central Coast’s ever-changing bounty as well as the canner’s current fixations. Sometimes, the Brussels sprouts are hard and dense. Sometimes they are looser. Maybe you’ll notice more garlic in a particular batch, or coriander or cumin. NATURE’S CANDY: Stormy T’s small-batch jars of jams, jellies, and pickled produce are packed with fresh, seasonal flavors just waiting to wake up your mouth. Try his better-than-candy pickled beets in a brine of red wine vinegar, cinnamon, allspice, star anise, clove, and ginger that you may just want to dab behind your ears—or drink straight from the jar. You can bet, however, that they will always be addictively crunchy and packed with a powerful wallop of flavor. I could honestly eat Stormy T’s Brussels sprouts like popcorn, and I can’t wait to top a carnitas taco with Trevino’s spicy pickled summer squash rounds. Like many of the canner’s diehard fans, I never thought I’d get so fired up about a few glass jars sitting in my fridge door. New fans are getting in on the action, too, with Stormy T’s now stocked at Lincoln Market, General Store Paso Robles, and SLO Natural Foods Cooperative. If all goes according to plan, Trevino could be looking at ditching his corporate day job for a far more flavorful future. Trevino, who proudly works a few nights a week at Dunbar Brewing Co. in Santa Margarita, is stoked to keep his hands in the craft beer world. Try his lip-smacking Lagunitas Hop Stoopid IPA jelly (now on the menu at Luis Wine Bar in downtown SLO), a sinful dessert when spread over a dollop of goat cheese. Like all of Trevino’s jams and jellies, sugar is used with finesse. If this sounds like a life-changing stocking stuffer to you, then you’d better hit up Trevino now. The canner is toiling away as fast as he can, but that still adds up to only about 30-50 jars per day—on a good day. YOU CAN DO IT! : Grab a few cans of Stormy T’s this holiday season at General Store Paso Robles, Lincoln Market in SLO, and SLO Natural Foods Cooperative in SLO. The unique gifts will also be for sale at the free Fair Trade Holiday Gift Extravaganza slated for 11 a.m. to 4 p.m. this Dec. 7 at Congregation Beth David in San Luis Obispo. For updates and contact information, check out the business’s page on Facebook. Small batch still translates into a massive workload for Trevino. Just last weekend, the canner reckoned with 30 pounds of beans and 90 bunches of asparagus. However, there is no time to pat yourself on the back when you’re in the business of preserving flavor. When all was said and done, 30 pounds of Brussels sprouts still stared him right in the eye. This is where partner in crime Hafley contributes to the effort, lending a hand to peel garlic or chop veggies. Although she sees the kitchen chaos, she also sees the reward. “There’s a lot of passion and joy that go into every batch that Stormy creates, and I think when you do something with passion and joy, you are going to feel it and taste it,” Hafley said. Trevino echoed that sentiment, whilst trying to rub a bit of beet juice off his nicest Western shirt. Hayley Thomas is chugging the brine straight from the fridge at hthomas@newtimesslo.com.